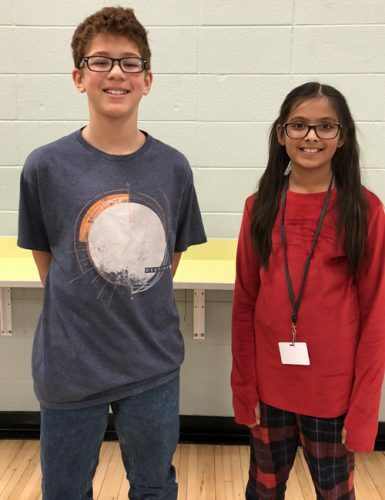 Pictured, from left, Washington STEM Academy spelling bee champion Mark Mills and runner-up Ipshita Singh. WARSAW — Washington STEM Academy is proud to announce Mark Mills as this year’s spelling bee champion. Mills is the son of Nicole Lewis, Warsaw, and Mark Mills, Colorado. Mills competed against 28 other students, making it to round 24 with the winning word “fulcrum.” The spelling bee runner up was Ipshita Singh, daughter of Pankaj and Mitul Singh, Warsaw. Mills will compete in the county spelling bee representing Washington STEM Academy on Tuesday, Jan. 29, at Milford School.